Live-stream your whiteboard content. 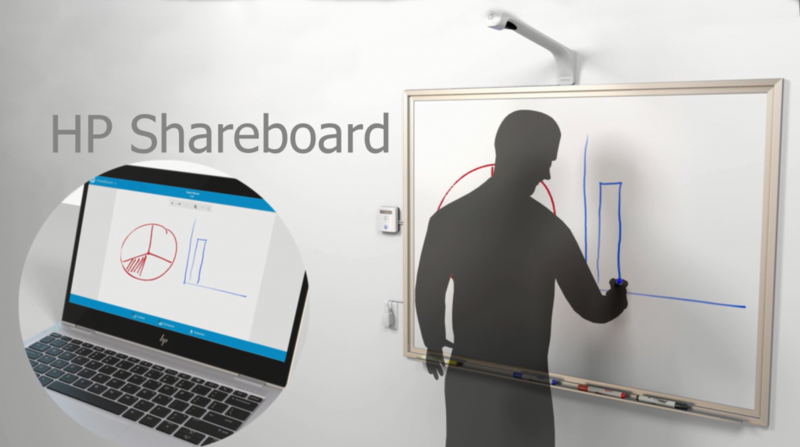 If you’re looking for a low-cost smartboard option, check out HP’s new Shareboard. The HP Shareboard transforms your existing whiteboard into an online collaboration system. It allows you to share a crisp and vibrant real-time feed of your whiteboard activity with remote attendees. Real-time connectivity is accomplished through a secure online connection to your Wi-Fi network and a web browser. No apps, downloads or plug-ins needed. You can broadcast a crystal-clear view of all your content with patented Kaptivo technology that removes distortion, shadows, people, and objects in front of your whiteboard before transmitting the image. 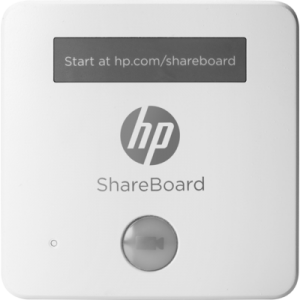 HP Shareboard has simple installation too! All you do is mount the camera on the wall above your whiteboard, connect its cable to the control pad, and plug the power cord into any wall outlet. HP Shareboard requires no software downloads to start using it. You will have a unique, private URL to invite participants easily. Contact our sales team today to learn more about HP Shareboard and start easily collaborating online with your team.